Many bike wheels use a hub known as "cup and cone", it's typical axle pictured above. This type of hub is easy to repair, but requires careful adjustment to reduce friction and extend its life. The cups are built into the shell of the hub and the cones are conical nuts that screw onto the axle. Steel ball bearings roll between these two parts. The combination of cup, cone and balls forms the bearing - with a bearing being on each side of the hub. If the cones are screwed too tight, they exert pressure on the bearing balls causing excessive friction. The bicycle wheel will not turn as freely as it can and the parts will wear out quickly. If the cones are not screwed on tight enough, the bearings will have "play" and the wheel will be able to shake back and forth on its bearings. This adjustment is very critical; corrections on the order of 10% of a turn or less are needed to get the optimal adjustment. 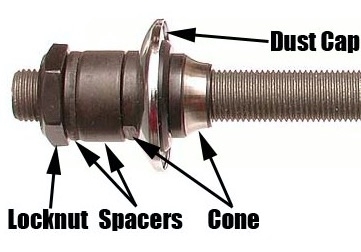 Most cup & cone hubs use locknuts to secure the cones in place: the cone and it's locknut are tightened against one another, usually with a washer in between them. This keeps the cone from going out of adjustment.